Due to the number of requests we have received asking if groups or families can stay in our unique stargazer glamping pod, we have commissioned a larger four person version from our friends at Unidome; and are proud to announce the arrival of our unique Galaxy Viewer Glamping Pod for 2014. Another first from Dorset Country Holidays Glamping, the Galaxy Viewer takes all the best parts of the Stargazer and scales it up so that families and groups can now have the same unique experience. 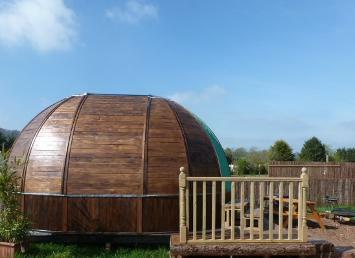 Made of ship lapped cedar; the Galaxy Viewer glamping pod is reminiscent of a beehive. With glass between each panel and the large see-through dome in the centre of the ceiling the Galaxy Viewer is bright inside but perfectly secluded so shut the door and close yourself off from the outside world. A double bed is located under one end of the Galaxy Viewer's skylight dome whilst a sofa bed is at the other allowing you to see the stars whether your relaxing or cuddled up in bed. The Galaxy Viewer similar to a hotel suite for two with its double bed and sofa bed making it perfect for a romantic retreat or use the sofa bed as a second bed and have a chilled glamping holiday for family and friends. *From 21.25 Per person per night four four people staying four nights. 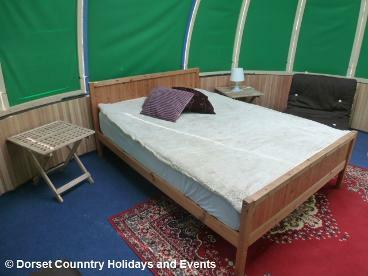 See glamping prices page for more details.